Hardwood flooring is environmentally friendly because it is a natural resource. Unlike most floor coverings, hardwood flooring is sustainable. Today, most hardwood flooring timber is cut from forests that are carefully managed to ensure sustainability. Hardwood flooring adds real value to your house when it becomes time to sell. Exotic Hardwoods are harvested in other countries around the world. Brazilian Cherry, Cumaru, and Tigerwood are some examples of hardwood that is harvested overseas. Exotics are typically harder than domestic hardwoods and have more color variation. They are extremely popular because of their color variation but are getting harder to attain due to the costs of importing. Red oak is one of the most popular flooring choices available because of its ability to coordinate with any design style. 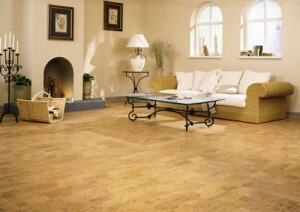 The reddish tones add to its beauty and its resistance to wear makes it a great option for high-traffic areas. Ebonizing wood is a simple way to add luxury to a space. The dark, opaque look complements many design styles but really stands out in a neutral, contemporary space. 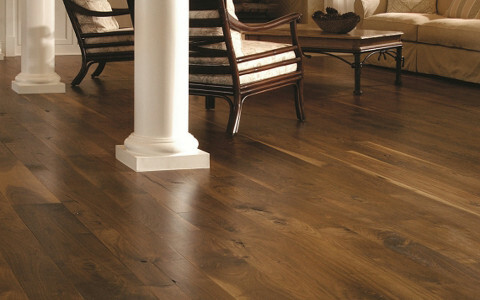 Dark hardwoods, such as oak, cherry and walnut, create the best sleek black look. The natural features of reclaimed wood bring warmth, and it’s a stunning choice for a bathroom once it’s treated. Reclaimed wood can be incorporated in traditional and contemporary spaces. If you want an exotic look, choose Brazilian cherry wood. The multitude of colors in the grain gives the floor a mosaic look. Aside from its visual appeal, its sturdy nature and affordable price make it a popular choice among exotic hardwoods. Bamboo is chic and less expensive compared to other hardwoods. Because it grows so quickly, bamboo is one of the most renewable wood materials on the planet and looks fantastic in a kitchen with a soft color palette. is not only plentiful and natural, it’s also hypoallergenic. Because the pre-finished floor already has been coated at the factory, it does not have to be sanded and finished on-site, thus is more convenient to install. Multiple coats of finish applied at the factory gives prefinished wood flooring a very durable wear layer, and the finish itself is under warranty by the manufacturer. Pre-finished can trap dirt between the boards because the flooring is not sealed on the job site. Solid site finished flooring is sanded and sealed at the job site. Most pre-finished flooring has a beveled edge. A site finished hardwood floor has a table-top appearance and is typically flat. A pre-finished floor will maintain height irregularities of the subfloor. Site finished flooring is sanded flat, so is more forgiving of slight irregularities or slight height variations. If your pre-finished floor gets damaged, it usually means replacing the boards to get a stain match, whereas site-finished hardwood flooring can, in most cases, be repaired with a sanding and finish. When installing hardwood flooring, it is necessary to top nail the boards along the perimeter, near walls or cabinets, to start the floor. On site finished flooring, these small nail holes are filled, then sanded and finished and usually not very visible. In prefinished flooring, these small nail holes are filled, but not sanded – so they may be a bit more visible. While we use the manufacturer-recommended prefinished filler, there are some floors which do not have an exact match of filler, such as stained flooring, or exotics. 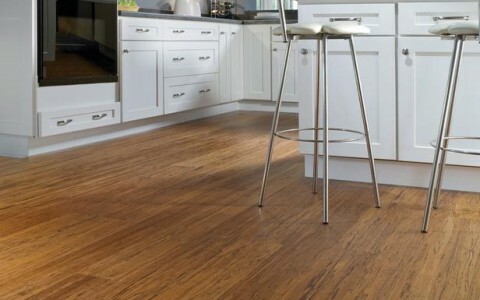 Over time, and possibly over home-owner changes, many people don’t know or forget the actual manufacturer of their pre-finished flooring product, which makes it much more difficult to get an exact match if board replacements are necessary at some point – or if they want to add additional flooring to other rooms of the home, and they want an exact match. Additionally some of the flooring may be discontinued in time, eliminating the availability of ordering in more if it becomes necessary to match. Site finished flooring offers more flexibility with repairs and adding connecting flooring to more rooms. Engineered hardwood flooring is usually less expensive than solid hardwood. It’s made of wood layers, but the layers below the surface are often composed of less expensive, wood layers. The top layer is the decorative wood you have chosen for your home or office. Engineered hardwood flooring is also more environmentally friendly than solid hardwood floors because the sub-surface layers are made from “junk” or “scrap” wood, not the ornamental wood. This approach saves more forests because each tree of the desired ornamental wood can go further than it does with solid wood flooring. Engineered flooring has superior dimensional stability. Unlike solid hardwood flooring, engineered flooring can be installed in any room that you choose, even a basement, because it can withstand moisture due to the layers of flooring that withstand buckling and rippling. Engineered flooring can also be installed over radiant floor heating, which can keep your feet warm during those cold winter months. It’s also easy to install and looks just as beautiful as solid hardwood flooring. Solid hardwood flooring comes in many different wood varieties, including exotic woods. Solid hardwood can’t be installed (or isn’t recommended) in high moisture rooms, like the kitchen, bath and basement. This is because the higher moisture content in the air — or even on the floor — can cause the wood to ripple or buckle, which will damage the flooring. Because you can refinish a solid wood floor more times than you can an engineered wood floor, this flooring type lasts longer, helping balance some of the environmental problems associated with some wood floors. Both Engineered and Solid Hardwood Flooring are made with REAL Hardwood. The first and the most important difference between Solid Floors and Engineered Floors is within their manufacturing process. Solid Hardwood is manufactured from a solid piece of wood, which results in a solid piece of hardwood plank – one solid piece of material all the way through the Hardwood floor, from sawing the wood until installing the floors; it’s all one “Solid” piece. Engineered Hardwood contains only one thin layer of real hardwood – which is the visible layer at the top of the plank. Engineered Flooring is made from multiple layers of softwood such as plywood or High Density Fibers (HDF), all glue down together with pressure, which results in a multi-layer plank with a top layer of pure Hardwood. Engineered Hardwood Flooring was invented in order to overcome certain climate and environment problems. Solid Hardwood Floors are very sensitive to moisture. When humidity levels are high, Solid Hardwood can cup (edges raised to a cup shape), crown (center inflate, edges slope down) and even crack. Due to this reason, it is highly not recommended to install a Solid Hardwood floor in an area with high levels of moisture, such as a bathroom, kitchen or basement. An Engineered Hardwood Floor is much more resistant and tolerant to moisture, humidity and can even withstand buckling and rippling. An Important aspect to remember about Hardwood is that there is no way to prevent the wood planks from expanding and contracting, since it’s a natural process wood undergoes when there are changing levels of humidity and moisture in the atmosphere. In Solid Hardwood flooring this process is much more visible because it affects each plank separately, while in Engineered Hardwood floors, the whole surface expands and contracts as one unit, which makes the gaps between the hardwood planks less visible. Most Engineered Hardwood Flooring can be installed using the Glue Down Installation Method or by nailing/stapling it down to another subfloor. 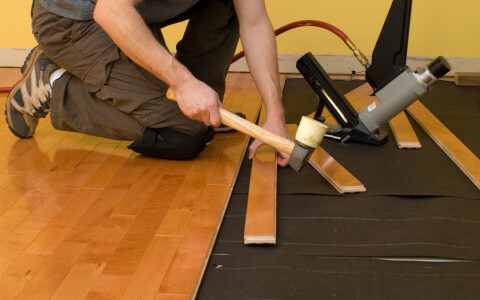 Solid Hardwood Flooring must be nailed down or stapled down to a subfloor (Ex. Plywood). The glue-down system just doesn’t give Solid hardwood enough freedom to expand and contract, something that may cause cracks and defects on the Hardwood floor. Bamboo Flooring is one type of Solid Hardwood Flooring that can be glued down like Engineered Hardwood flooring, as well as nailed or stapled down like Solid Hardwood flooring. Another advantage of Engineered Hardwood is that it can be installed directly on cement and/or concrete slabs. Solid Wood Floors must be nailed down to a subfloor surface and just can’t be laid directly onto concrete surfaces. Another aspect and technique within Hardwood Flooring Installation is the Radiant Heat Flooring System. If you’re thinking of installing one, then you’ll probably want to go with the Engineered floors. Solid floors are just not a good combination with this kind of system. Another large difference between Engineered Flooring and Solid Floors, when talking about life expectancy is the refinishing aspect. Solid Wood usually comes in a 3/4″ Thickness, which allows you to re-sand it and refinish it for more than 5 times. This ensures you a product that can last for over 100 years! In Engineered Flooring this subject varies and depends completely on the thickness of the top layer of Hardwood. We strongly recommend that you stay away from Engineered Flooring products that have a very thin top layer of Hardwood. It will be very difficult to repair or change this floor to something else in the future. So if you are thinking ahead, Solid Hardwood flooring is probably a better choice for you, although today’s Engineered floors can lasts for many years as well. What about Design? Which Floor looks Better? Engineered or Solid floors? When we’re talking about look, design and what is more appealing or which style to choose, it is important to keep in mind that if the hardwood species, stain and finish are identical in both kinds of flooring, then it is almost impossible to tell the difference between Engineered flooring and Solid flooring. Today, the Engineered Flooring industry is so advanced and developed that you can find any species, with any stain, in a variety of widths and thickness – all catered to fit the most unique of tastes and styles. Thanks to the fact that there is only one thin layer of hardwood on engineered floors, manufacturers can provide us with expensive wood species (such exotic wood species) and wider hardwood planks at a cheaper, more affordable price. Of course, there is huge variety within Solid Hardwood Flooring as well. It’s possible to find many new species, stained in a variety of different colors –in order to perfectly fit your tastes and preferences. Because of the way they are designed, the planks that are making the engineered flooring board, will always tend to move in different direction from one another with the end result being that, there is very little movement at all even under the most drastic environmental changes. The solid floor, on the other hand is very sensitive to moisture changes. It requires a longer period of acclimatization prior to the installation and, ideally, is better to have a humidifier installed in the house in order to keep the moisture at the same level all year long. Of course, there are differences between hardwood floor species, not all of them reacting the same way to environmental changes. Because of its increased adaptability, engineered flooring is very versatile being installed in almost any area of the home, including basements which had been a no-no for many years when it comes to wood flooring. The only area I don’t, personally, recommend is the bathroom, but I have seen it installed in there as well. The fact that it can be installed floating and glued down as well, makes engineered flooring the option of choice for the condominium units where nailing of the floor is not an option and the sound-proofed floors are a main requirement. Hardwood floors are, almost always, the first option for people living in single unit homes. They are known for their durability, are thicker than engineered therefore offering more sanding out of it and are very customizable. A hardwood floor, properly installed will last more than 100 years. Even though the general opinion is that they can’t be installed floating, therefore making them incompatible for the high rise buildings, that is not the case anymore. By using a combination of nailed down floor and floating plywood subfloor, the sound barrier requirements are being met, as well as the “no nails to the concrete” policy that every building has. Hardwood floors can’t be installed directly on top of a concrete subfloor. First, your contractor will have to install a plywood subfloor and nail the floor to it. Because of this, the installation of hardwood floor, if the existing subfloor is concrete, will cost more than engineered flooring. Even though, both, engineered and solid floors can be found in both forms, unfinished and prefinished, unfinished engineered floors are more expensive. If you have in mind a certain design, that will require the installation of an unfinished floor, hardwood floor is probably the cheaper option. Hardwood floors might squeak in the future. Because it can only be nailed down, hardwood floors require extra attention during the installation process, in order to stay squeak free for a long period of time. Unfortunately, very few contractors nowadays are taking the time to do the job right. This is why you should make sure you trust your contractor 100% before having him install your hardwood floor. Engineered floors don’t resist pet’s abuse as good as hardwood floors. If you have pets, especially bigger dogs, installing hardwood floors instead of engineered is probably the better option.